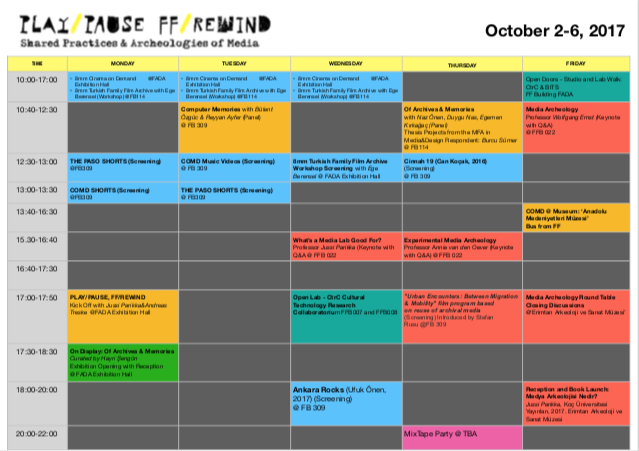 Celebrating the launch of its Media Archeology Lab, Bilkent University Department of Communication & Design invites you to “Play/Pause, FF/Rewind,” a five-day event on Shared Practices & Archaeologies of Media. The event gathers together international scholars and artists exploring media archaeology. The keynote speakers of “Play/Pause, FF/Rewind” are Wolfgang Ernst, Annie van den Oever and Jussi Parikka. 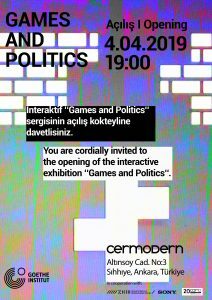 The program will conclude with a roundtable discussion of October 6th from 6 to 8 pm at Erimtan Arkeoloji ve Sanat Müzesi. Bilkent Üniversitesi İletişim ve Tasarım Bölümü, Medya Arkeolojisi Laboratuvarı’nın açılışı vesilesiyle, sizleri “Play/Pause, FF/Rewind” başlıklı beş günlük etkinliğe davet eder. Medya arkeolojisi alanındaki uluslararası öğretim üyesi ve sanatçıları biraraya getiren etkinliğin davetli konuşmacıları: Wolfgang Ernst, Annie van den Oever ve Jussi Parikka. Etkinlik programı 6 Ekim saat 17.00’de Erimtan Arkeoloji ve Sanat Müzesi’ndeki yuvarlak masa oturumuyla sonuçlanacak. Click to enlarge the image. / Resmi büyütmek için tıklayın. Wolfgang Ernst is Professor for Media Theory at the Institut für Musik und Medienwissenschaft at Humboldt University, Berlin, where he co-runs the Media Archaeological Fundus. He has had teaching experience and guest professorships at several universities (Kassel, Leipzig, Cologne, Weimar, Bochum, Paderborn). Other publications in English: Digital Memory and the Archive (2013); Sonic Time Machines (2016); Chronopoetics(forthcoming 2017). Current research fields: time-based and time-critical media processes; implicit “sonicity” in techno-mathematical media; experimenting with the writing of media time in non-historiographic ways. Annie van den Oever Associate Professor Arts, Culture and Media / Film, University of Groningen, The Netherlands. Director of the Master in Film Studies. Director of the Faculty Minor in Film Studies. Head of the Film Archive and Media Archaeology Lab, University of Groningen. Jussi Parikka is a media theorist, writer and Professor in Technological Culture & Aesthetics at Winchester School of Art (University of Southampton). Parikka has a PhD in Cultural History from the University of Turku, Finland and in addition, he is Docent of Digital Culture Theory at the University of Turku, Finland.